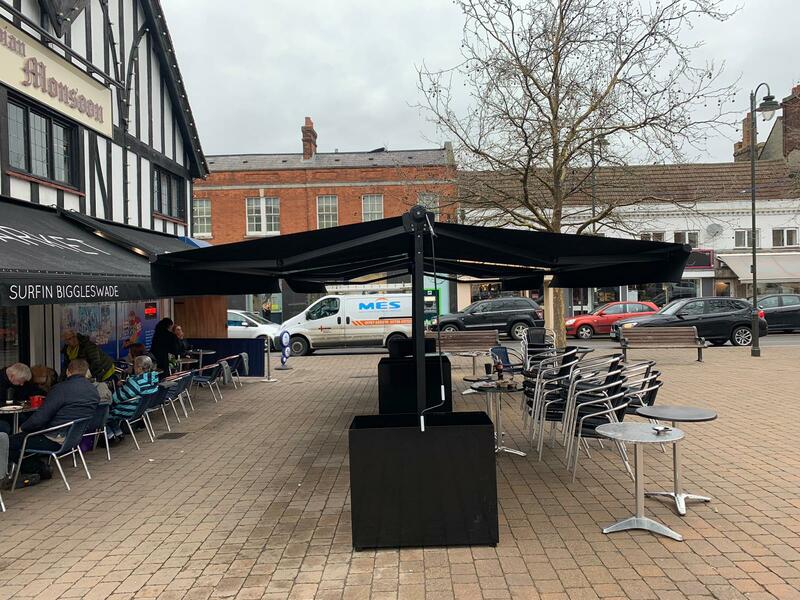 We recently installed four Victorian Shop Blind Awnings at Surfin Café in Biggleswade – Bedfordshire. 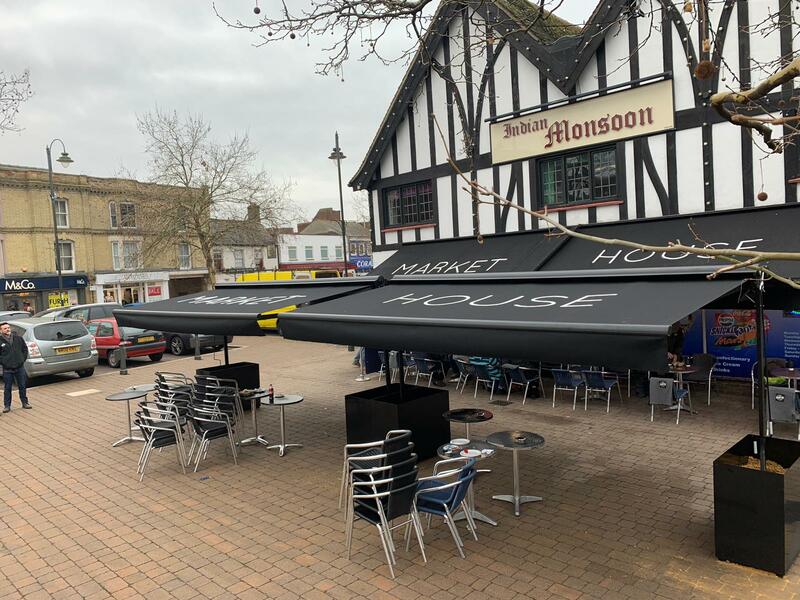 In order to make the most of the market square and increase the amount of covers they can serve we returned this week and installed a new back to back awning system (sometimes referred to as a butterfly system). Four awnings installed onto a goal post framework which is fully removable. The planters house shingle and weights to keep the awnings stable. 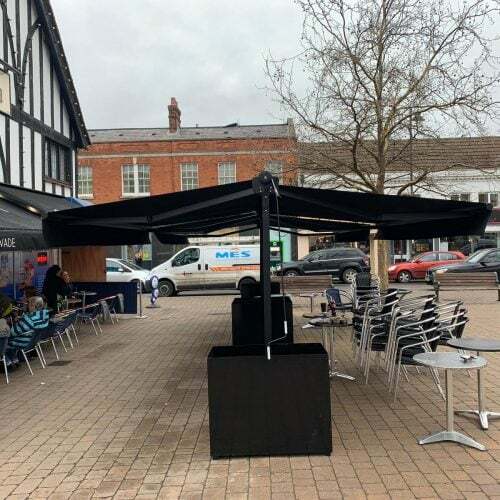 By adding this type of system it gives the café another 17 square metres of outside space. 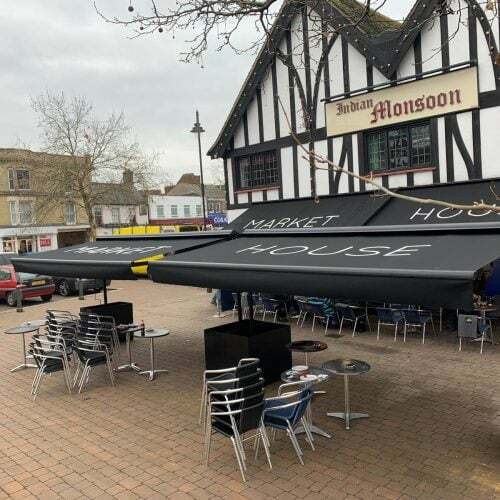 All the awnings have been sign written by our awning graphics department who can reproduce any design with the use of technology and years of experience. 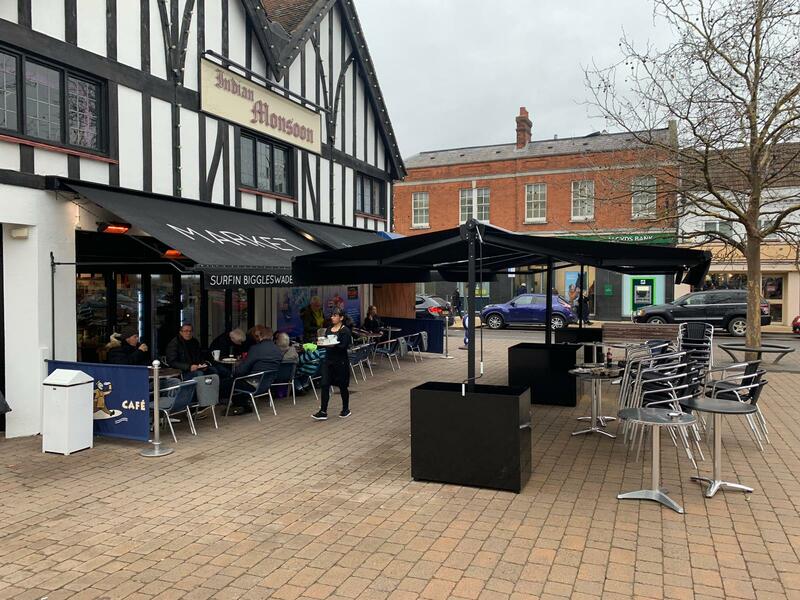 Our sales executives have great knowledge of the blinds and awning market which allows them to discuss with the client in detail what their needs are and what the solution is. 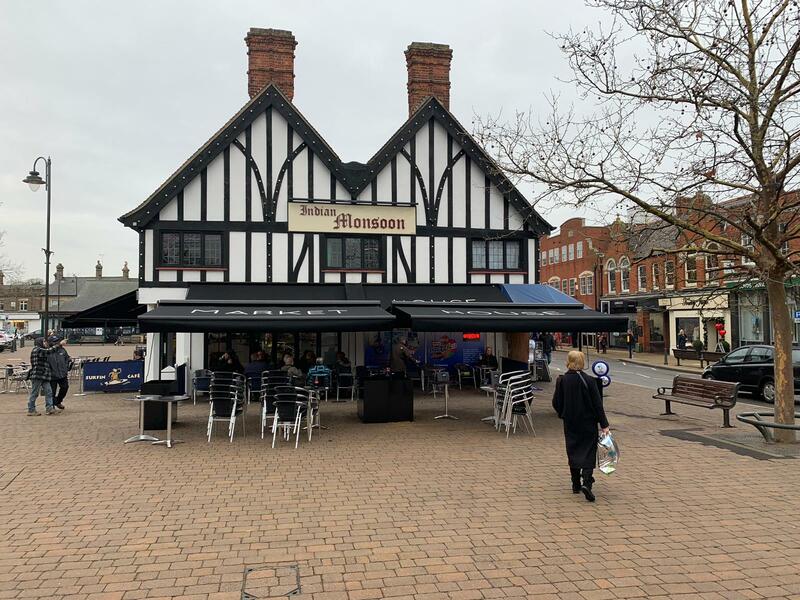 They are famed for their delicious home-made food; assorted Panini’s, toasties and sandwiches alongside their freshly baked cakes, pastries and tray bakes. They also gladly support local, specialist bakeries to provide a full and varied range of great bake-off goods. Their love for coffee keeps them busy finding and introducing the new trends and artisan offerings, but they are equally excited to bring you their range of refreshing and flavourful teas, blended frappes and smoothies. A unique and comfortable space to enjoy with friends, or some time for yourself. 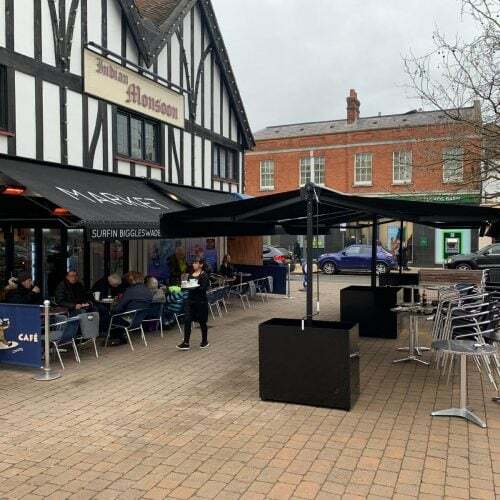 Surfin Café also have another Café in Ampthill, Bedfordshire. Biggleswade is a market town and civil parish located on the River Ivel in Bedfordshire, England. 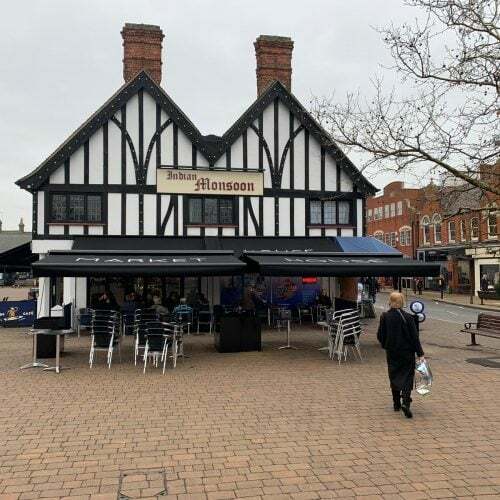 It is growing in population mainly because of good transport links along the A1 road between London and the North, and via Biggleswade railway station on the East Coast Main Line.